ICIS provides spot gas prices and insightful market information for the Belgian gas markets, covering the physical hub Zeebrugge as well as the new virtual hub Zeebrugge Trading Point (ZTP). The daily insights provide readers with benchmark gas price assessments and indices, as well as analysis and news for the Belgian spot gas markets. The information is published in our European Spot Gas Markets report, which provides the most comprehensive round-up of Europe’s gas markets. The daily report not only informs readers of market developments across the Belgian markets, but also provides a complete picture on 12 established and emerging European gas markets including the British NBP, Dutch TTF as well as the German NCG. 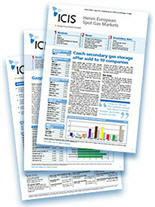 Our gas markets coverage goes further than any other to bring transparency to the European gas markets. The coverage is tightly focused on spot gas trade, giving readers all the information they need to be competitive across the Belgian as well as in other key European gas markets. Traders embed our independent pricing information in their contracts & deals. Analysts are supplied with the latest insights on supply & demand dynamics, competitor movements, regulatory changes & key events. Operations managers, risk managers and risk analysts use robust pricing information to help manage portfolio exposure, market-to-market, & in profit and loss (P&L) reporting. Procurement managers can access the latest prices to strengthen their positions in price negotiations. Senior-level executives & managing directors can track important price developments and the latest events in key regions they are interested in. Heren indices and price assessments from ICIS have been trusted by industry players for over 20 years, giving you the insights you need to make well-timed decisions in key gas markets.